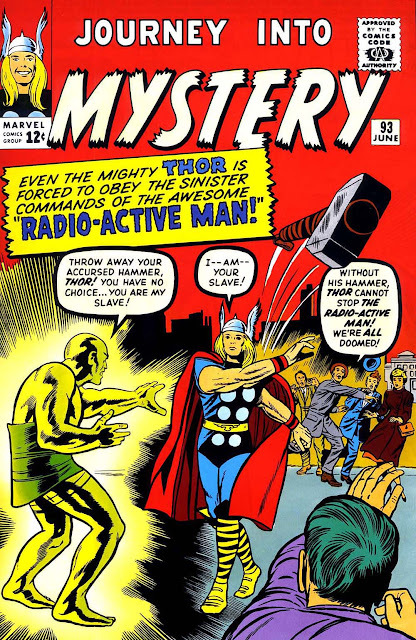 This issue also features the debut appearance of Chen Lu, the Radioactive Man (although, as indicated on the cover, the word is hyphenated all throughout). 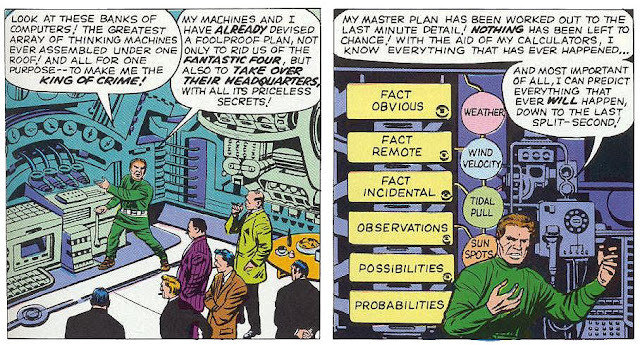 When Chinese forces are turned back from their Indian assault by the timely arrival of Thor, they turn to their top scientists for advice. Fortunately, Dr. Chen has just figured out a way to use radioactivity to imbue a human with extraordinary power - and, in an alarming change of plans, decides to test it on himself. Y'know, because that always goes well, and there's nothing more harmless than rampant radiation. The experiment an improbable success, he is now supremely powerful, can melt or destroy objects simply by willing it, and is protected by a sort of repelling force field. Also? When he walks he leaves sizzling footprints in the asphalt, which is always pretty cool. The real-world events make for a compelling backdrop, and for the first five pages convey a seriousness to the story - yes, superheroics and all - that's rarely found in these tales. 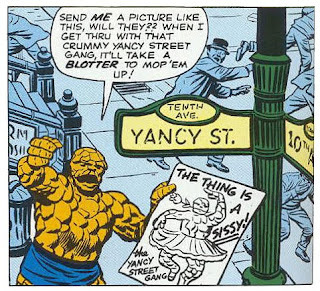 And then, on page six, all of that screeches to a halt with the kind of ridiculous turns usually only found in a Larry Lieber Ant-Man comic. 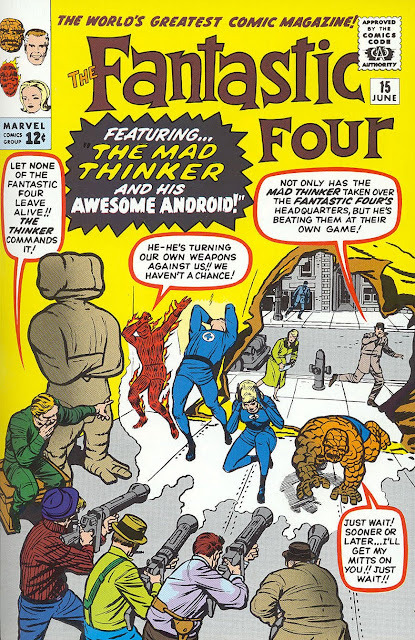 Strangely, the culprit this time appears to be Jack Kirby, surprisingly back for a single issue in the middle of Joe Sinnott's run. First off, as Dr. Chen Lu returns to his lab we see that it's ... in a converted Buddhist temple. Why? No reason. Then, as Chen takes stock of his equipment, we see that his assistants are all robots. Golden, shiny robots. Why? The dialogue blathers something about not trusting men with the secrecy of his new discoveries ... but I'm guessing that Jack just wanted to draw robots! It doesn't lessen one's enjoyment of the story - far from it - but the tonal shift is, shall we say, something of a surprise. 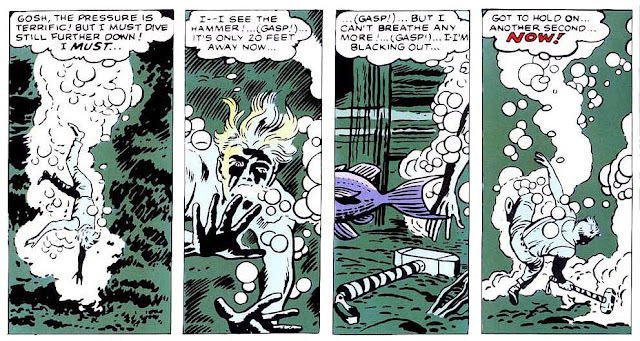 Kids: Don't throw your hammer in the ocean. You'll just have to fish it out later. One of the joys in reading these old comics is picking up the newest issue and seeing the villain: Is it some one-shot baddie? Is it the first or evolving appearance of a well-known rogue? Maybe it's some obscure Marvel villain who had a few early appearances but soon disappeared. And so there's an initial reaction when reading the captions on the cover: "Oo! The Red Barbarian? Who's that?" followed immediately by the reaction when looking at the villain's uniform: "Oh. Never mind." Yes, it's another "dirty Commies" story! But while the Soviet general is of no interest, we're considerably surprised by the agent who comes to offer his services. He calls himself The Actor, and with the use of a rubbery face and a little makeup, claimes he could impersonate anyone. (Even, bizarrely, the metal-suited Iron Man.) 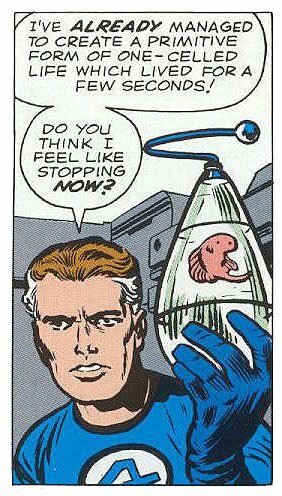 What's confusing about this to even a moderately knowledgeable Marvel reader, of course, is that his schtick is essentially identical to that of infamous Spidey foe The Chameleon, who appeared just a few months earlier and was also a Soviet spy. Needless to say, neither the Actor nor the Red Barbarian would be seen again. 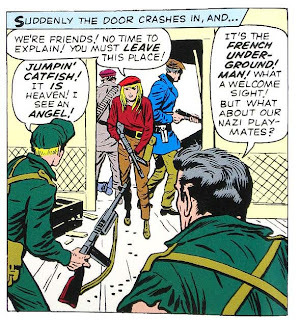 As the story opens, Iron Man is foiling a group of Commie spies who are attempting to steal "America's newest atom bomb" (can a comic get more 1960s than this?) before demonstrating to army personnel his prototype for a disintegrator ray. Yes, that's right: A DISINTEGRATOR RAY. 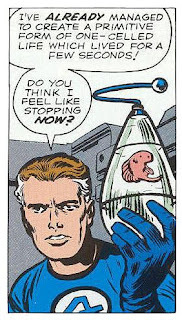 Despite vaporizing an entire monster tank and a two-foot thick wall, Tony apologizes for the ray not being ready yet. Why, if he could just figure out how to enlarge the ray, it could disintegrate "a fleet of enemy battleships or even a great metropolis"! Which, even allowing for the fascinating complication that our hero is an arms manufacturer, really leaves us wondering if Tony has finally become completely drunk with power. Then again, future stories would assert that his father, Howard Stark, worked on the Manhattan Project - so I suppose he's not that far afield. Plotwise, the story's a bit of a mess. When The Actor, disguised as Tony Stark, raid's Starks laboratory in search of the disintegrator plans, he also comes across "various metal spare parts ... gleaming like gold!" ... and somehow leaps to the conclusion that Tony Stark is Iron Man. Rather than telling anyone, however, he opts to keep it to himself, in case he ever needs to get out of a bind. When Tony realizes that the plans have been stolen, however, he quickly catches up to the Actor, imprisons him, and returns to the Red Barbarian's base with the plans. Passing himself off to the general as The Actor dressed up as Iron Man, Stark explains that the plans are in the attache case he carries, which is closed with a time-lock that will only open in four hours. So the general congratulates him, tells him to come back then, and lets him leave (with the case). Iron Man then frees The Actor before leaving the country, and when The Actor returns to the Red Barbarian without any plans ... the general shoots him. And not a single thing I've recapped here makes a lick of sense...! and the use of the silent middle panel is really quite gorgeous. Brace yourself for a change: There are no superheroes anywhere in this comic! Yes, Stan Lee & Jack Kirby's newest creation was a war comic, a genre lacking from Marvel's output for some time. 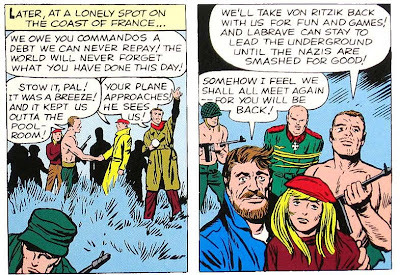 Stan and Jack had both depicted wartime in comics during the early days of World War II - most notably in Jack Kirby & Joe Simon's Captain America, as well as the WWII efforts of the Sub-Mariner, the android Human Torch, and more - before shipping off to service themselves: Stan in 1942, Kirby in 1943, and both of them returning home in 1945. So they each had very real experiences to draw upon in shaping this comic twenty years later, from the missions they ran to the kinds of men they served with, and the result is plain to see: The first issue of Sgt Fury is compelling, exciting, and even a bit shocking. For the first time since Fantastic Four #1, you get the feeling that Stan & Jack were firing on all cylinders, and working on a project that they really believed in. Immediately noticeable is the mixed-race cast of Fury's team. While this admirably reflects the reality of the enlisted men they served alongside, such ethnic diversity wasn't something generally portrayed in comics of the time. (In all the comics reviewed on this site so far, how many non-white characters have appeared? And how many of those as non-villains? Off the top of my head, I count Ho Yinsen, who helped Tony Stark build his first Iron Man ... and that's it.) While there were thankfully few missteps as embarrassing as the Legion of Super-Heroes' Tyroc blunder in 1976, it's worth keeping in mind that, yes, even into the 1970s decision-makers at the big companies displayed questionable judgment on the issue of race. In fact, in this first issue Gabriel Jones was famously colored the same hue as his companions; the colorist who worked on the issue had colored the character correctly, but the printer noticed the "error" and "fixed" it. That's the story, at least, but it seems somewhat suspect: After all, the idea that someone might have assumed this to be a mistake is perhaps plausible, if horribly naive ("Why would there be a black man in a comic book?"). However, we're not talking about one panel being corrected, but a character's appearance throughout. Can we truly believe that the person responsible for the "fix" really thought the colorist accidentally chose the wrong color on one character, in every panel that character appeared in, in the entire book? Cornered, boxed in, with nowhere to go ... and then saved, miraculously, by members of the French Resistance! 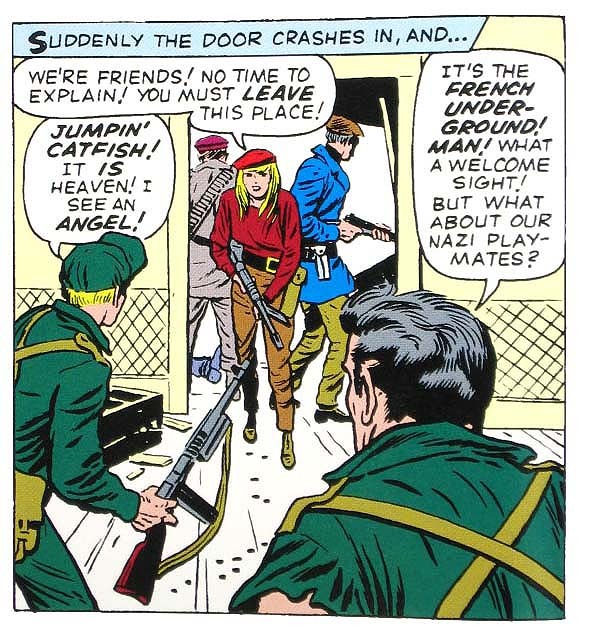 Perhaps the most shocking thing to the typical reader of Silver and Bronze Age Marvels is how the comic doesn't shy away from a soldier's obligation to kill his enemies. The pre-modern superhero comics always made a point that heroes don't kill, and even their villains were rarely shown to engage in more than mere dastardly behavior; the unintentional joke in reading a Rawhide Kid comic is how he always disarms his opponents by harmlessly shooting the guns out of their hands, rather than shooting the villains themselves. But here, while good taste is utilized in the depiction - we see grenades launched and a Molotov cocktail lobbed, but no sight of flaming bodies or destroyed limbs - there's no denying that they're fighting for keeps here. Even with the wildly over-the-top style with which the action is portrayed, that distinction alone places the comic on a different level than all of the (nevertheless enjoyable!) superhero comics Marvel was producing at the time. Sgt. Nicholas Fury is a take-no-prisoners kind of guy. Stan and Jack, being masters of their craft, knew the need to start off strong. Which is why this first mission for Fury's team is a big one: ensuring that D-Day goes off without a hitch! As the comic opens, we see LaBrave, leader of the French underground, radioing US troops for aid - right before Nazi soldiers burst in and capture him! Since he knows the time and details of D-Day, Fury's superior officer explains, it's imperative that he and his Howlers track down and liberate LaBrave from the clutches of the enemy before they can torture the information out of him. It's a difficult task, and the forces arrayed against them are mighty; in fact, a reader of the time might be forgiven for wondering, near the end of the story, if the title character had indeed been killed off in his first issue! 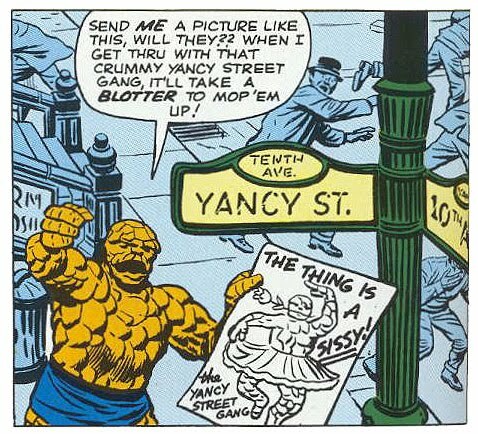 Stan has said that he felt the Sgt Fury comics he did with Jack Kirby were some of the finest stories he ever wrote - and upon reading it ourselves it's hard to disagree.